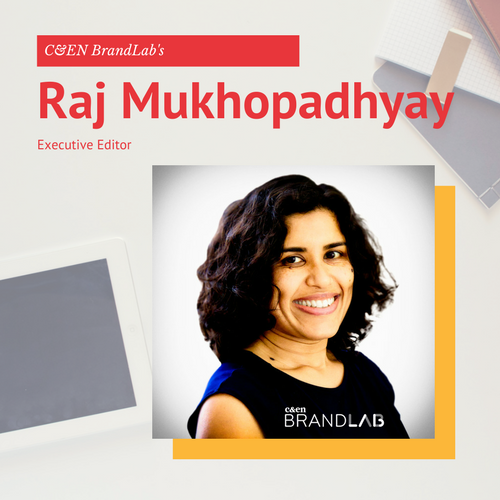 While Raj Mukhopadhyay considers herself a science writer, other monikers for her might include storyteller, archaeologist, entrepreneur, trailblazer, or detective. Her own story is evidence of all of these roles, including the professional one she currently fills at C&EN Media Group as the Executive Editor of C&EN BrandLab. We chatted with her to tell just a bit of her journey. Raj was born in India but spent much of her childhood in the Middle East. At age 16 while attending a British-system school she had to choose a career path. Ever practical, she eschewed her lifelong love for writing and opted for what she considered a “more assured career path” in science. She could make a respectable living this way—as opposed to the dire “starving artist” existence that she imagined of most writers. She faithfully followed this trajectory with a biochemistry undergraduate from McGill University, all the way through to a Ph.D. at Johns Hopkins University—where she spectacularly crashed and burned in her third year. Her boyfriend at the time (now husband) encouraged her to revisit something that she always loved—writing. At the time, Hopkins offered the Odyssey program, which included excellent creative writing instruction. On a whim, she took a class. On the very first day, she felt an enormous weight lifted from her. For the remainder of her time at Hopkins, she pursued both science studies and writing classes, but with no idea how she could combine the two until her department chair introduced her to the concept of science writing. He also introduced her to Edith Nichols, then-editor of Hopkins Medical News magazine (now Hopkins Medicine magazine), and convinced Edie not to worry about Raj’s lack of experience, and to take Raj on as a writer. Under the tutelage of the Hopkins media relations staff, Raj taught herself how to write. She credits people like Edie and Joanna Downer, then Assistant Director of Basic Science Communications at Hopkins, among many others who mentored her. This is where all of Raj’s other “titles” come into play: First, finding the stories themselves can be a process. Like any other journalistic piece, it’s necessary to find the nugget, and then determine how it’s been told before (because no story is unique, she avers). So what’s special about this particular story, and what is the best way to tell it? Further, a story without considering its audience is a shot in the dark. What about this story will best resonate with your particular set of readers, making it both scientifically accurate and also compelling and engaging? To be sure, this is a team endeavor, she points out, not a solo excursion. Producing a story is a complex and collaborative process, and one person cannot go at it alone. “It takes a village!” she declares. If you tell a story well, it will still “have legs” several years down the road. She also believes strongly in the longevity of good stories—they are never flashes in pans. If you tell a story well, it will still “have legs” several years down the road. Having a deep repository of content is an incredibly valuable asset for a brand, which is why branded content and publishers are natural companions. What is the key to finding good stories? According to Raj, it’s being immersed and aware enough to recognize when something sticks out. When a client has a new product, it’s often not the product itself that’s the hook. Rather it could be the discovery of the product, the process of how it was brought to market, the story of an individual on the research and development team, or how the product can or has helped a person or community already. Marketers can learn to spot these unique angles for perspective stories by paying attention, being immersed, and developing antennae for the unusual. Raj does this by reading newspapers, social media, journals, and an otherwise wide range of media from all over the world. Once, she and a colleague were collaborating on a series on defying stereotypes when she happened across a story in the Washington Post business section on Ben & Jerry’s, the maker of ice cream. One small detail caught her eye: Jerry Greenfield failed medical school twice! She zeroed in on that tiny nugget of information and emailed Ben & Jerry’s public relations office to ask if in fact Greenfield had a bachelor’s in science. As it happens, he does. And that became their story. It’s a very tough climate in which to be a scientist. So how do marketers go about both engaging and educating this audience that is often completely absorbed and focused on their research, teaching, or work? For Raj, one of most important part of selling to scientists is authenticity. As a prime example, Raj still remembers the person who sold her reliable pipettes as a student. She viewed him (and that company) as an ally because he was helping her do her research. In another instance she was in the lab late at night and had an issue with a centrifuge. When the company’s customer service rep was available to help at that late hour, they instantly became the most important person in the world to her. These are powerful ways that brands can ingratiate themselves to their key markets, and instances like these make excellent content for compelling marketing campaigns. Chances are if it’s happened to one researchers, it’s happened to many. If your employees are available at all hours of the night to ensure that research can be done—safely and effectively—that’s a story worth telling. One of the ways, of course, is to be sure you are always factually accurate. Especially with native advertising, do not sacrifice scientific integrity at any stage in content creation. Scientists are in the business of seeking the truth, so they are not easily swayed by inflated, disingenuous, biased or worst of all, inaccurate marketing messages. We live in a rapidly changing era. While Raj is a big fan of being open to new things, she’s also not one to shut the door on traditional forms of media. For instance, look at the oral storytelling traditions and how that’s been reshaped into podcasting. Series like Serial and S-Town have become viral hits. According to Raj, true innovation is all about knowing the different tools available and understanding when and how to use them effectively. As a storyteller, it’s important to always keep an eye on different ways to tell stories, and be willing to take a chance. I’m a big fan of experimenting. Some things may flop, but if you keep testing and trying new things, you’re likely to come up with something really awesome. Raj is curious to see how science marketers might use Facebook live more widely. “It’s so raw and unedited that it innately conveys a sense of authenticity.” For instance, what do things look and feel like inside a chemical plant, or in the halls of a pharma company, or even in their cafeteria? 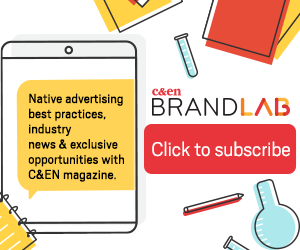 There are a few brands and campaigns that have caught Raj’s eye recently as examples of just how interesting, compelling and engaging branded content can be. Buzzfeed is the outlet that really broadened her horizons on what branded content could really do. One piece that stays with her is a listicle of gifs sponsored by Tylenol called 11 Science-Defying Situations Where Time Stands Painfully Still, which she found hilarious, very clever, and perfect for the Buzzfeed audience. Tylenol also sponsored a series of videos on Buzzfeed.